The big, secret trick to Pesto? Make it how you like it; thick or thin, with more pine nuts, with less, with garlic or not. You can’t go wrong if you make it how you like it. Just use the best ingredients you can. Some say to make pesto only by hand with a mortar and pestle, other only use a knife and never a blender or food processor. Personally, I love using the food processor for pesto . 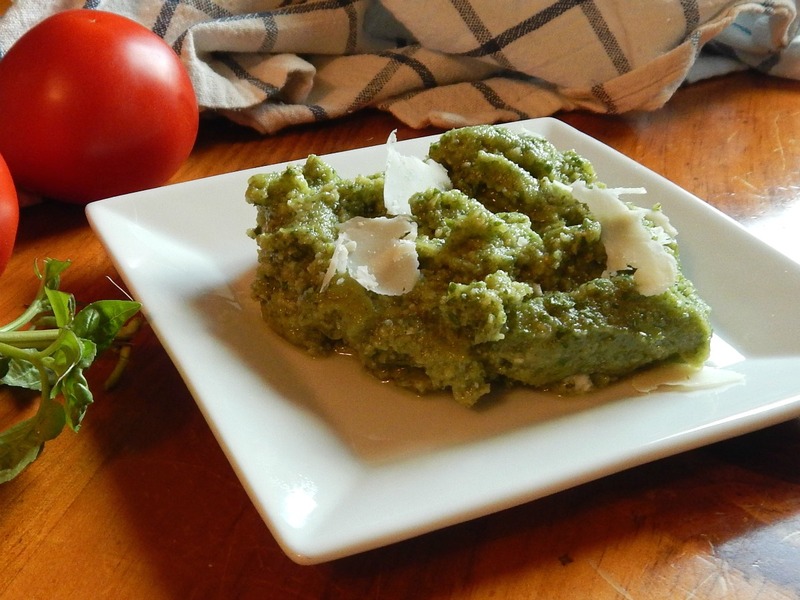 A store-bought Pesto costs about $4.99 for a seven ounce (about a cup) container, so if you were buying as much as this recipe costs, you’d be spending about 10 bucks. Grow your own herbs, in the yard or in a pot…it’s so much better and a huge cost savings. This pesto, using my basil, grocery store olive oil and Parmesan ran $1.72. Add as much or as little as you’d like to a pound of high quality pasta to make a fantastic, fresh meal for your family. Thin it out for an awesome Salad Dressing, or try this family fave: Pesto Pasta Salad with Grilled Vegetables. Add basil, pine nuts, salt and pepper to food processor, while pulsing, drizzle in olive oil. Scrape down sides. Add cheese and about 2 to 3 more times. If too thick, add a little olive oil or even a bit of water. Should keep in fridge for a couple days and freezes very well. There are probably as many variations on Pesto as there are families that make it – add some hot pepper flakes, add other herbs (parsley, cilantro, etc.) Vary your cheeses…vary your nuts. I’ve seen Broccoli pesto, Radish, Spinach and Squash pesto…heck, just go wild! Don’t stop with using Pesto on your Pasta (say that three times fast!) but check out Food Network’s 50 ways to use Pesto. This entry was posted in Click here for Bargain Meals, Click here for Fabulous Food Posts and tagged Bargain Meal of the Week, Freezes Well, Frugal Hausfrau, Italian, Olive oil, Parmigiano-Reggiano, Pasta, Pesto, pine nuts, Salad Dressings, Sauce, Vegetarian Meal. Bookmark the permalink.